WOKKA’s going on ? – WOKKA SAKi rebranded. Extreme Spirits Ltd, the owners of the award winning and unique WOKKA SAKi are pleased to announce the rebrand of their eclectic ‘east meets west’ vodka. As from 1st August 2008 the brand will be known as ‘WOKKA – FUSION VODKA’. 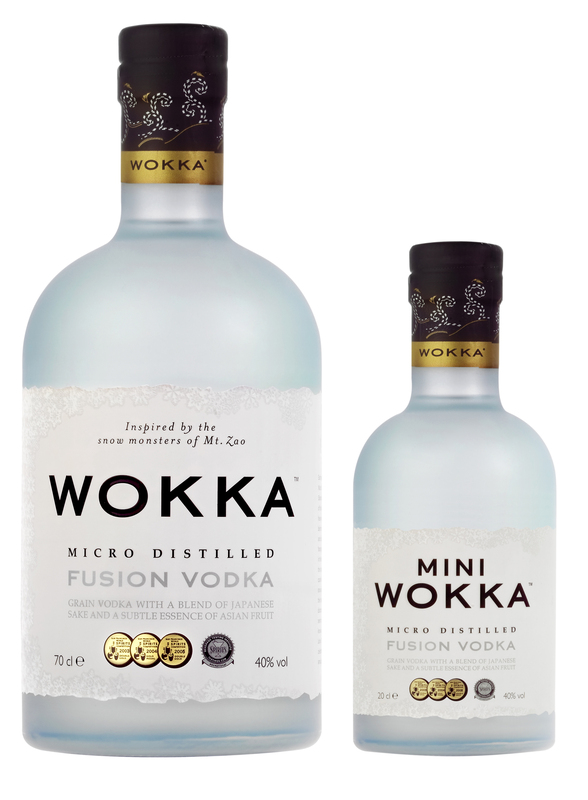 Simultaneously, the company is launching a quarter size version (20cl) bottle known as ‘MINI WOKKA’ (see new packshot attached). WOKKA is a micro distilled grain vodka with a subtle blend of Japanese sake infused with Asian fruit. Tim Day Marketing Director of Extreme Spirits commented: “After conducting considerable research in the UK and USA, both the trade and consumer unanimously prefer the name WOKKA. By declaring the brand as a ‘FUSION VODKA’, we have in fact defined a new category and one which better personifies the nature of WOKKA”. WOKKA Saki was launched in South Beach Miami on April 2005, and is now exported internationally to 10 countries. It is the only flavoured vodka that has twice won ‘Double Gold’ from the San Francisco International Spirits Competition, considered to be the most prestigious spirits event in the world. Tim Day enthused “The addition of ‘MINI WOKKA’ is very exciting for us and it has been specifically created to serve the Asian fusion restaurant sector. MINI WOKKA will be served as a four person serve sipping vodka sake in high end restaurants to accompany food; it is particularly impressive when paired with Sushi”. What is a ‘FUSION VODKA’? The information in this email is confidential and may be legally privileged. It is intended solely for the addressee and access to this email by anyone else is unauthorised. Any views or opinions presented are solely those of the author and do not necessarily represent those of Extreme Spirits. If you are not the intended recipient, any disclosure, copying, distribution or action taken or omitted to be taken in reliance on it, is prohibited and may be unlawful. If you have recieved this email in error please notify Extreme Spirits Ltd. This press release was distributed by ResponseSource Press Release Wire on behalf of Extreme Spirits Ltd in the following categories: Food & Drink, for more information visit https://pressreleasewire.responsesource.com/about.